Surfed with us in May or June? Then you are in the running to win an awesome weekend in beautiful Byron Bay! Byron Bay: The most Easterly point in Australia and surfing mecca of the world! It is where Australian surfers and non surfers alike love to holiday! Byron has become a ‘style capital’ of the coast and not only amazing surf spots but also a vibrant arts scene, fine dining and great nightlife. It is a place of outstanding beauty which makes it a must visit destination! We have packaged together an ultimate getaway for two people to WIN which includes; return flights*, two nights in a Superior Suite at the Byron at Byron Resort and Spa including daily breakfast and a massage. 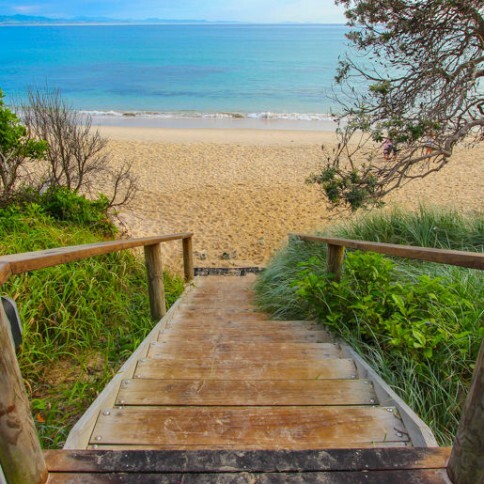 2 x private lessons from Lets Go Surfing and a beachfront dining experience at The Beach Byron Bay . Big shout out to our mates from The Byron at Byron Resort and Spa and The Beach Byron Bay for making this prize possible. Press the play button to see what you could be experiencing! Not in the draw? You have one week to take an Adult Group Lesson in Bondi or Maroubra to enter……P.S. the Bondi Surf Lessons have been reduced to $69 for the last two weeks of June use coupon code EOFY10 on checkout for this epic deal!